Native to parts of Asia including Nepal, India, Vietnam, Malaysia, Thailand and Bhutan. This species occupies wet habitats ranging from Riverine forests, woodlands, grasslands, marshes and swamps usually in lowlands but up to elevations of 2800m in Nepal. 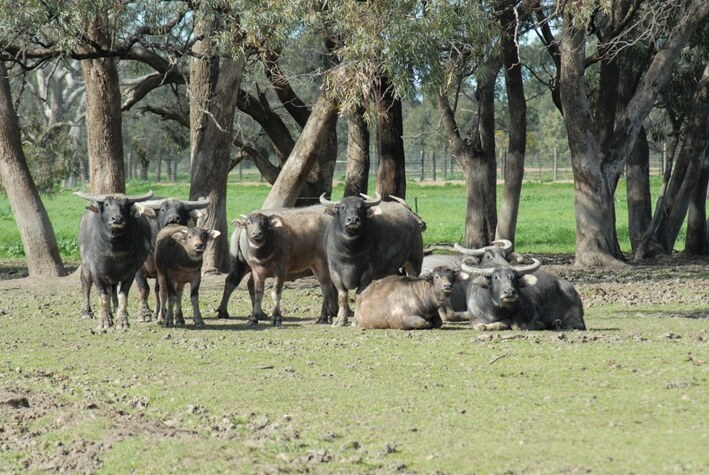 The Asian Water Buffalo has been predominantly domesticated and introduced buffalo can now be found widespread reaching as far as North Africa, and the Near East, as well as Australia, Brazil and Central America. Wild water buffalo are larger and heavier than domestic buffalo, and weigh from 700 to 1,200 kg. Their head-to-body-length is 240 to 300 cm, with a tail 60 to 100 cm long, and a shoulder height of 150 to 190 cm. Both sexes carry horns that are heavy at the base and widely spreading up to 2 m along the outer edges. Their horns exceeding in size compared to that of any other living bovid. Their skin colour varies between ash gray to black. The tip of the tail is bushy; the hooves are large and splayed. The domesticated Water Buffalo is often referred to as the ‘living tractor of the East’ and is relied upon for ploughing and transportation in many parts of Asia. They are gentle creatures and are easy to tame. Water Buffalo spend most of their time submerged in the muddy waters of Asia’s tropical and subtropical forests. They have wide splayed hoofs to prevent them from sinking too deeply in the mud and allow them to move about in wetlands and swamps. 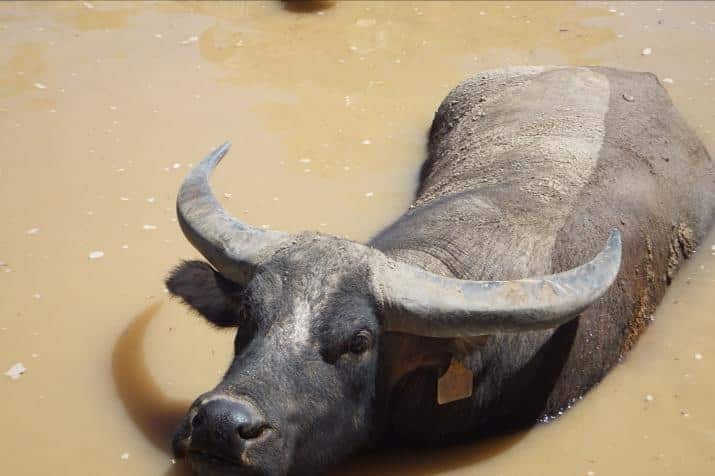 Unusually the sound made from a Water Buffalo resembles a “quacking” noise. Water Buffalo have been domesticated for more than 5,000 years. They have assisted in humanity’s survival with their meat, horns, hides. Milk, butterfat and with power for ploughing and transportation. 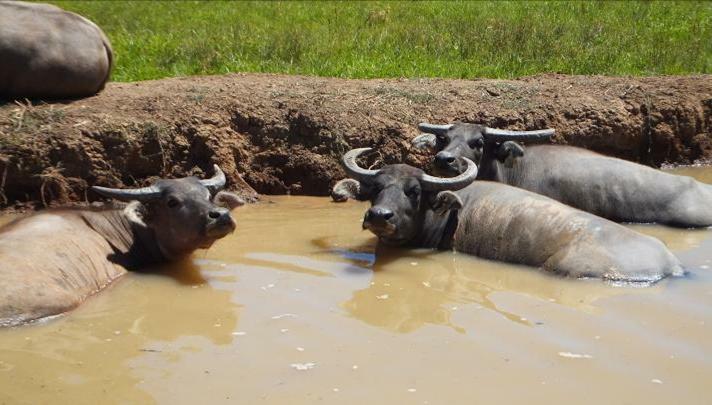 Water Buffalo are also used in fighting & racing festivals which still operate today in the Philippines. Reproduction: Females typically produce a single calf after a gestation period of 9-11 months. Young females will stay with their mothers herd for the duration of their lives whereas young bulls will create bachelor herds after 3 years. Threats: Hunting, habitat loss, degradation as agricultural land use expands, diseases and parasites transmitted by domestic livestock and competition of food and water supplies.